We’ve created the Easy Direct Debit brand from scratch. Working on logo design and colour scheme that harmonised and felt friendly and simple. Easy direct debits approach is “fast, flexible, fuss-free payment collections” so the branding needed to emulate this feeling from the start. We began by building an online presence for the brand – you can see the results here. But as with all financial business marketing and particularly direct debit marketing there is a whole range of promotional and administration items required to run the business efficiently. Although the business is essentially based in the digital world, Easy Direct Debits still believe in marketing their product to their customers through print media too. 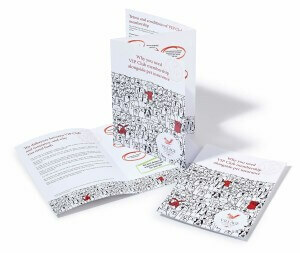 Apart from the usual printed suspects; stationery, business cards, flyers and leaflets, we’ve designed and printed, ‘thank you’ greetings cards and direct debit mandates. We’ve also printed promotional items including; engraved key rings, screen printed ‘piggy banks’ and mugs. Easy Direct Debits (EDD) provide marketing support for the clients that use their payment collection facilities. One customer, Village Vets in Formby, needed a leaflet to help their customers understand the benefits of joining their VIP (Very Important Pet) club and the benefits of having insurance services that run along side this product. EDD asked us to design a 6pp, z-fold document with their branding in a fun and easy to understand format. We created a generic template design which EDD could roll out to other veterinary practices with only a simple ‘brand’ colour change, replacing of the veterinary practices logo and the name change throughout the printed terms and conditions. Marketing and design articles to help businesses (and profits) grow! Don't worry we hate spam too. We totally respect your privacy. You can opt-out and choose what emails you receive at any time!